Keeping in line with my other posts this week. 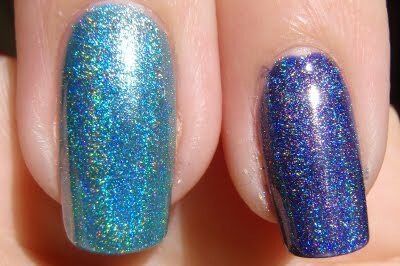 Here is Nfu Oh #65 - aka the Blue holo. 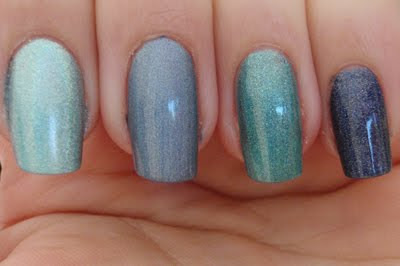 Very pretty blue/aqua coloured holo. 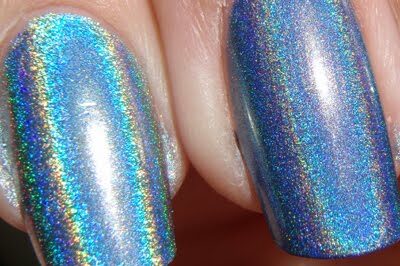 Fantastic linear holo finish. 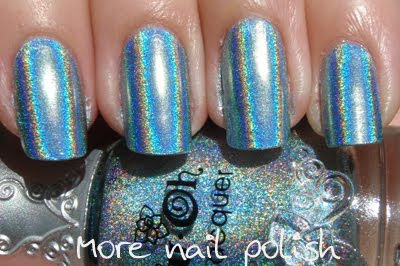 Application, finish, wear etc same as the other Nfu Oh holo polishes. This was three coats. Nfu Oh #65, China Glaze 2Nite, Artform 3D Dark Blue, OPI DS Glamour. The Artform 3D polish I only got last week. In fact I got four new artform holos, and I think they are very cool. I will post about them separately soon. Here is a close up of Nfu Oh #65 and 2NITE. Both linear particle holographic but #65 is more aqua and 2NITE is more cornflour blue. Close ups of Artform 3D Dark Blue and OPI Glamour. In the sun, the Artform 3D Dark Blue polish is a similar colour to #65 but has more scattered holo finish. I haven't worn the new Artform 3D Dark Blue polish as a mani, so I can't comment on its wear yet, but the wear on #65 and 2NITE isn't great, they flake and chip very quickly. OPI Glamour lasts a bit longer. 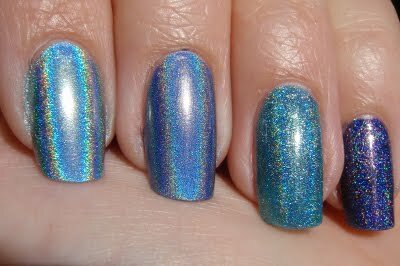 I have the green holos ready to go, but I'm just waiting to receive Nubar Reclaim in the mail to do the comparison swatch. Hopefully it will arrive this week. 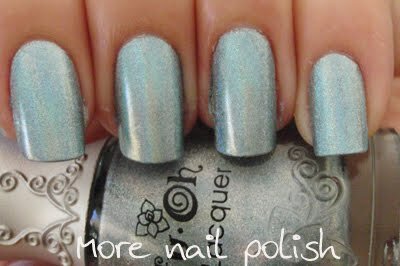 Any yet another brand of polish I have never heard of...whereabouts is Artform 3D Dark Blue purchased from? The Nfu-Ohs are gorgeous....just cant bring myself to fork out $30 each for them. I love the comparisons. I can't believe how much the nfu oh fizziz compared to the others in your comparison picture. Konadobsession - I'll post today about the Artform 3D, and where to get them - Only for Aussies this one! where can I get one of these? i mean, any site? Che a mi me gusta.